When I first looked at the shower on KL my initial thought was “Will we be able to squeeze into that compartment?” Well I’m pleased to report my perception was entirely wrong. The shower is 700x700mm and we do fit. Although I’ve found it difficult to bend over and pick up the dropped soap! 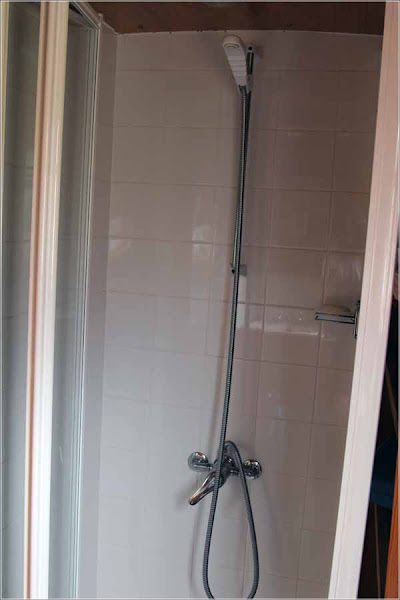 The shower is lined with tiles and has an adjustable height water saving rose. The shower compartment is located against the corridor wall which means it’s not affected by the tumblehome on the boat. By comparison, our planned shower stall dimensions on Waiouru are 900x900mm. Should we need the space, we could probably reduce the size of the shower to 700x700mm. Another difference is the shower will be lined in laminated waterproof wallboard. Actually the entire bathroom will be lined with water resistant laminated sheeting. Jan has already made up her mind that she didn’t want to be cleaning the grout between tiles. Our compartment is also planned to be against the side of the boat and will curve in at the top with the tumblehome. However it should be possible to fit the water mixing valve below the gunwale. Actually, if we opted for the same size shower as KL then we would have room for a adjacent floor to ceiling 200mm wide storage compartment. That would be useful. Rethink required as a result of our KL experience! The double bed on KL is in-line and 4’x6’3”. The advantage of an in-line 4’ wide bed is you can get past it during the day Peter & Margaret recently purchased a new inner-spring mattress. This has provided us with the opportunity to test both an in-line bed and an inner-spring mattress. The mattress is certainly comfortable and we are able to sleep on a 4’ wide bed. There’s enough room for “hot tongue” but insufficient for “cold shoulder”. With an in-line bed one of us has to sleep against the side of the boat. This may make it a cold night in winter. You can guess which of us has taken the corridor side of the bed on the pretext they have to get up frequently during the night to visit the small room. I think we will stay with our 5’ wide cross-over bed and accept it will have to be assembled and made-up every day. The jury is still out on the memory foam –v- inner-spring mattress decision. Here's something to try with your 4ft bed: pull the mattress out about 3 inches, so it's not under the gunwales. You'll be surprised how much bigger the bed feels.